Motorists, bicyclists, and pedestrians who have passed Piedmont Avenue and Baker Street have probably spotted skateboarders sitting along the wall of Folk Art Park, taking a break from the heat, or awaiting their turn at one of the ledges, benches, or boxes within the half-city block.The area officially known as “Quilt Tradition” was built in 1996 as a public-art installation for the 1996 Summer Olympics. For skateboarders, the spot they commonly call Black Blocks almost immediately became a safe haven.“Not only is Black Blocks virtually ignored by most people Downtown, but it’s the lifeblood of the Downtown Atlanta skate scene,” says Andrew Murrell, a local social media manager and writer who’s working to keep the area accessible for skateboarders. 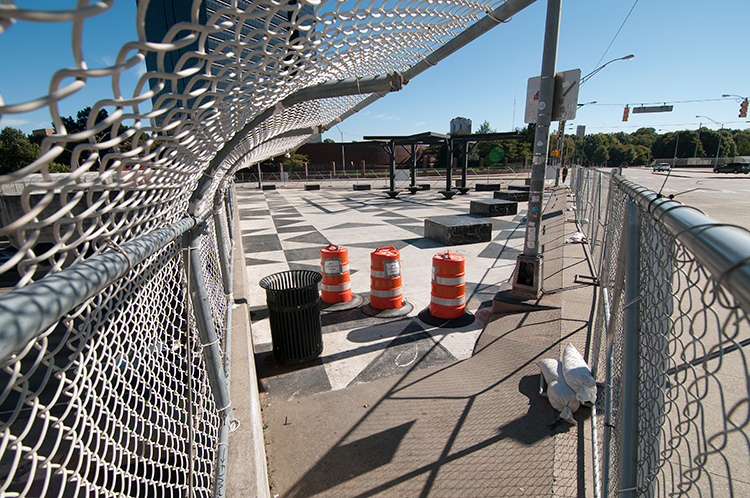 On Sept. 19, however, skaters found the iconic black-and-white checkerboard pavement fenced off, with no notice or explanation, Murrell says. The posted signs broke the news that the park would be closed until the end of 2017 to restore the open-air public-art piece. Murrell wants to be sure when Black Blocks reopens that skateboarders can return.The Atlanta Public Arts Legacy Fund, an organization assigned to preserve public art owned by the City of Atlanta, received $300,000 from the Georgia Department of Transportation, in addition to $100,000 and a required 20 percent local funding match, provided by the Atlanta Downtown Improvement District. According to the project’s website, improvements will include additional lighting, landscaping, signage, restoration of sculptures, fencing, and bird deterrents. “Anti-skateboarding devices” will also be installed.The news prompted Murrell to launch a petition calling on Central Atlanta Progress, which is affiliated with the ADID, to not include anti-skateboarding features on the renovated park. Failing to do so would stifle an organic skate spot that’s won over local and national skaters.“Spots like Black Blocks are important because they represent certain regions and specific skate scenes,” he says. “It’s a unique layout and a unique atmosphere that skateboarders can immediately recognize on film or in a picture. There are hundreds of generic, pre-fabricated skate parks across the globe, but there’s only one Love Park, only one Justin Herman Plaza, only one Southbank, to name a few. … Why stifle an organic cultural identifier like that?” Murrell says Black Blocks’ layout — “it’s spacious, unique on film, and has enough obstacles,” he says — plus the little chance of being bothered made it “a must-stop on any agenda involving the Southeast, and the spot’s popularity grew as more and more visiting professionals and tourists stopped by.” According to Murrell’s petition, the park also did not have so-called “bust spots” designed to deter skateboarding on the ledges and edges.Plus, says Ryan Parks, a skateboarder who frequents Black Blocks, the park’s organic nature — it wasn’t designed to be a skate park, but it functions as one — makes it ideal. “Kids travel there from all over well before they can really skate there,” Parks says. “They go just to see it. The next time they go, they might be a little better, and they can approach the ledges. That relationship continues to build. Black Blocks is a spot where possibilities continue to unfold the more that you skate there.”Murrell and a group of others are trying to create as much awareness as possible. The group’s Change.org petition has attracted nearly 6,500 signatures — he didn’t expect it to reach 1,000 names — and they’re hoping to meet with city officials shortly. In a statement, Jenna Garland, a spokeswoman for Mayor Kasim Reed, said the city is proud of Folk Art Park and is “committed to ensuring that all residents and visitors, which includes the skateboarding community which has adopted the public art area as a skate park, get to enjoy the unique art for years to come.” Garland says all sides are working together and they hope an agreement “allows residents to use the public art area for skating, but promotes practices to protect the art.” They will consider rules used at other “skate park locations” and adopt those standards for "Quilt Tradition."